Sea otters use their whiskers to sense vibrations in the water. 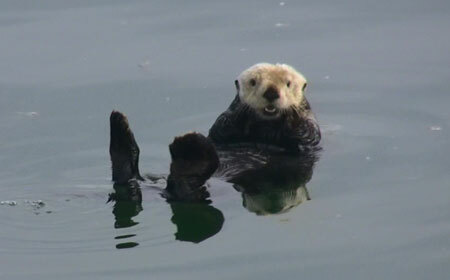 The sea otter is the largest member of the weasel family. Their fur is made up of a dense underfur, ranging in color from brown to black, and longer guard hairs. The guard hairs can be brown to black to silver. Their hind feet are webbed to aid in swimming, and their front toes are short and stiff. Adult sea otters may grow up to 5 feet in length. The males weigh 80–100 pounds but can weigh more than 100 pounds. The females are smaller, weighing 50–70 pounds. Female sea otters reach sexual maturity at 2–5 years of age. Males become sexually mature at 4–6 years of age. Sea otters breed throughout the year, but in Alaska most pups are born in the late spring. Female otters give birth to one pup at a time. Pups are 3–5 pounds at birth and light brown in color. The pup generally rides on the mother’s chest as she swims on her back. A mother sea otter will not leave her pup unaccompanied except to dive for food. The pup is weaned after 3-6 months. By this time, it weighs approximately 30 pounds and appears almost as large as its mother. Sea otters forage in relatively shallow coastal waters. They dive to the bottom to catch their prey and surface to eat their food. The dives generally last 1–2 minutes, but they can hold their breath for over 5 minutes. Dive depths range from 5-250 feet. Upon surfacing, the otter will roll onto its back and place the food on their chests. They eat using their front paws and will use tools, such as rocks (which they store under their "arm pit" while diving), to crack open shells. Their main prey species include sea urchins, crabs, clams, mussels, octopus, fish, and other marine invertebrates. Sea otter teeth are adapted for crushing hard-shelled invertebrates such as clams, urchins, and crabs. Sea otters rely on their high metabolism and their plush coat to keep warm. However, this high metabolism requires them to eat a lot of food. In order to maintain its body weight, a sea otter must eat 25% of its body weight per day. Sea otters have the densest hair coat of any mammal, with 800,000 to one million hairs per square inch (humans only have 20,000 hairs on their whole head). When sea otters are not foraging, you often see them grooming their fur. They do this to dry their fur and remove salt crystals and excess oil, which fluffs their fur and traps air. Their body heat warms the trapped air and further insulates them. The trapped air provides 4 times as much insulation as the same thickness of fat would provide. Sea otters are very good swimmers. They can spend their whole lives in the water though they may occasionally haul out on land to rest. However, they are very clumsy on land and won’t venture more than a few yards away from water. Sea otters are very social animals. They sometimes travel in groups and may gather together to rest. Concentrations of over 1,000 animals have been seen floating together in a single area. Breeding males are territorial and defend areas where females are concentrated. They will drive other males out of their territory. Nonbreeding males may form their own groups in an area just outside the breeding territory. Sea otters do not undergo long distance migrations. They generally remain in a home range that may be a few square km up to 40 km2. Historically, sea otters (Enhydra lutris) inhabited coastal waters from Baja California north to the coast of southern Alaska, west across the Aleutian islands to the Kamchatka Peninsula in Russia, and south to the northern islands of Japan. Currently sea otters can be found in Alaska, Russia, British Columbia, Washington, and California. The northern sea otter subspecies (E. lutris kenyoni), is found in the Aleutian Islands, Southern Alaska, British Columbia, and Washington. Within Alaska, there are 3 stocks. The Southeast stock can be found in the coastal waters of Southeast Alaska. 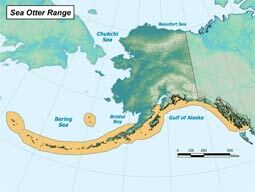 The Southcentral population spans from west of Glacier Bay to the eastern edge of Cook Inlet. The Southwest population stretches from the western edge of Cook Inlet out the Aleutian islands. Globally, sea otters are considered to be secure. Within the state of Alaska, the Southeast and Southcentral stocks are stable. The Southwestern stock is listed as threatened under the Endangered Species Act (ESA). To learn more, visit the ADF&G Special Status page for northern sea otter. Russian explorers began the sea otter fur trade in the 1700s. By the 1900s, sea otters had almost been driven to extinction and were locally extirpated in many places. Following protection under the Fur Seal Treaty in 1911, the sea otter population rebounded dramatically in the 20th century. In Alaska, sea otter populations in Southcentral and Southeast Alaska have stabilized or are continuing to increase. However, in southwest Alaska, sea otters have experienced a sharp population decline in the last 20 years. Threats to sea otters include predation, overharvest, fishery interactions, disease, and oil spill. There is concern, particularly in the Aleutian Islands, that increased predation by killer whales may be leading to declines in sea otter populations. Sea otters are vulnerable to overharvest due to their low reproductive rate. They also have the potential to interact with fisheries either through gear entanglement or competition for food resources. In the Kachemak Bay area, there have been an unusually high number of subadult male sea otters dying from Streptococcal endocarditis, encephalitis and/or septicemia, referred to as Strep. syndrome. Finally, sea otters are at high risk in the case of an oil spill due to the high percentage of time they spend floating at the water surface, grooming their fur and potentially ingesting oil. 50–100 pounds, up to 5 feet in length.